By Scott Gilfoid: It’s not personal with #8 WBC Manuel Charr (23-1, 13 KO’s). He’s using the rusty and small former WBA heavyweight champion David Haye (26-2, 24 KO’s) as a stepping stone to get another shot at WBC heavyweight champion Vitali Klitschko next year. Charr was beaten last September by Vitali after he suffered a cut that caused the fight to be stopped early. Charr’s plan for that fight was to take the aging 41-year-old Vitali deep and then drown him in the later rounds when Vitali fades. 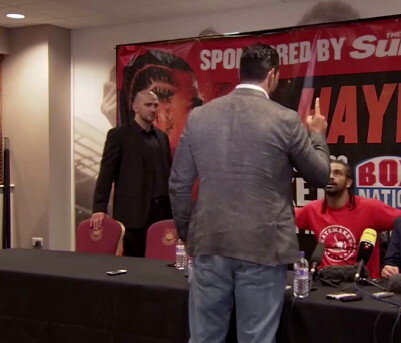 Charr and Haye fight next month on June 29th at the Manchester Arena in the UK. While Haye thinks Charr is slow and easy to hit, Charr sees Haye as someone that is just too light in weight to do anything to him. Charr might have a point. He weighs 250 lbs. of rock solid muscle, while Haye is a tiny 210 lbs and he has to eat his way to 214. We’re talking about a weight difference between 35 and 40 lbs. on June 29th. I thin Charr should forget about Vitali. The big Ukrainian fighter could retire without ever fighting again, and if he does fight again, it’ll likely be his last fight against Bermane Stiverne this year. Even if Vitali fights on beyond that, we’re talking pretty much about a fighter that is fighting only one time per year. Vitali hasn’t fought at all in 2013 and if he does fight Stiverne that’ll be the only fight he has this year. He did fight twice in 2012, but I don’t see that happening anymore. I think he’s easing his way into retirement, and it just doesn’t pay off to be waiting for an entire year for him to fight each of his opponents. If Charr beats Haye, he’ll still likely have to wait three years to get a shot against Vitali with the guy fighting once a year. There are a lot of guys in front of Charr and Haye and unless the World Boxing Council pushes the Haye-Charr winner to the top, we’re still probably talking about at least 2 years before they get a crack at Vitali.